Hello! 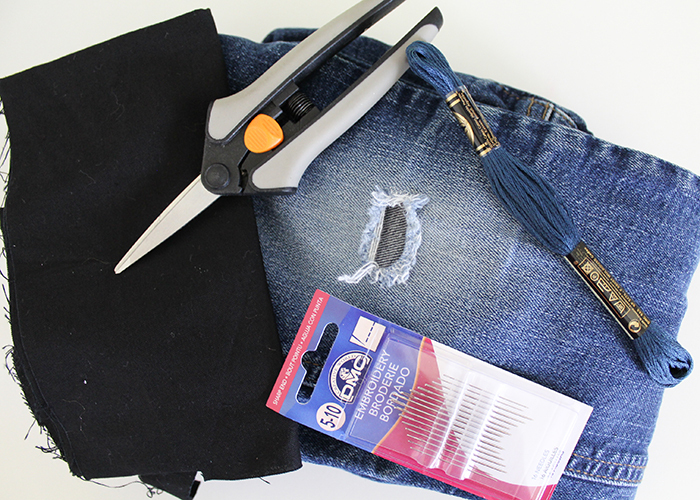 Today I’m going to share three really cool ways to patch kids jeans! These are easy and trendy, and so much nicer than traditional patches. 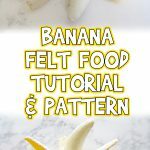 Two involve basic sewing, and one is ironing only, so these are great for beginning patchers. Let’s get started!! 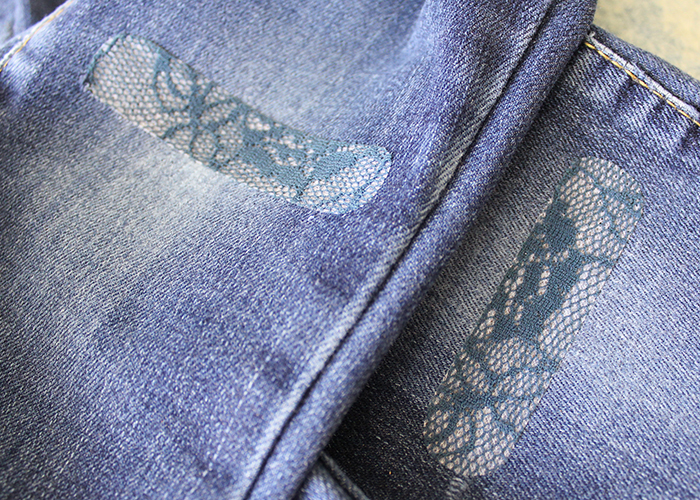 This way of mending comes from Japan and is known as boro or sashiko, depending on who you ask. It’s a way of layering fabrics with decorative geometric stitching to reinforce weak spots and mend holes while making the clothing still attractive. 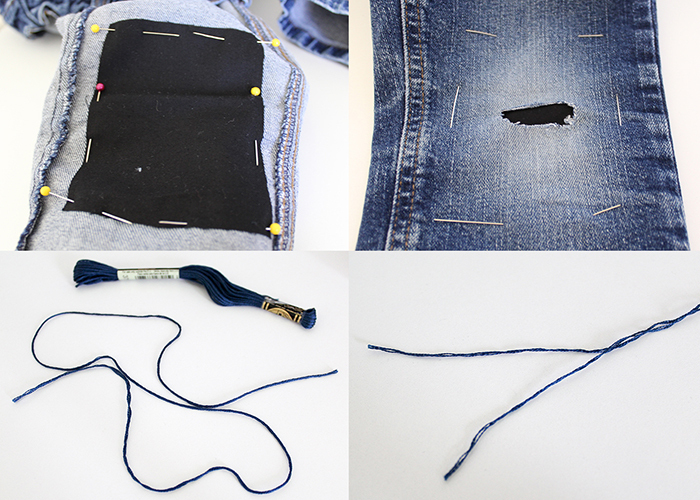 I love this method of mending, and think it looks amazing, especially for boys jeans. It’s traditionally done with white embroidery thread, but I chose to use blue as my son gets his jeans very dirty and the white wouldn’t hold up quite as well. This is great for scrap busting and uses minimal supplies. Jeans with holes or weak spots in the knees. Scrap fabric. 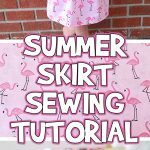 You can use extra denim, basic quilting fabric, or any fabric you’d prefer. Embroidery needles. These have larger eyes and are easier to thread. 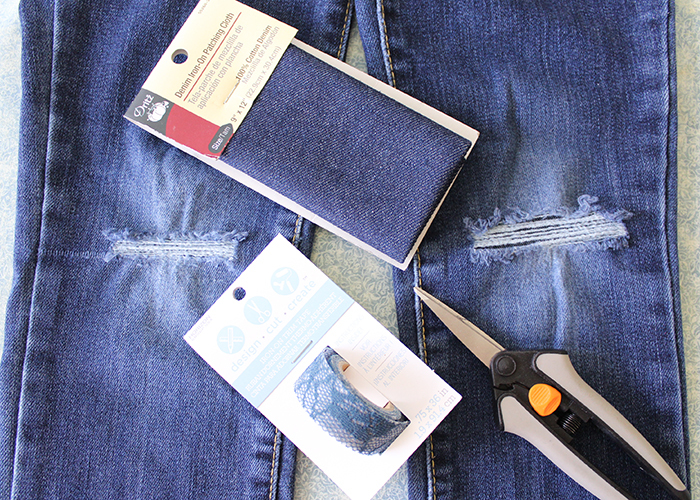 Start by trimming off any loose threads or frayed spots, leaving a clean hole. If you’re just reinforcing a weak knee, you don’t need to trim anything. Next, cut your fabric of choice to fit the size of the weak area. I typically like to cover the majority of the knee area, but you can make it whatever size you’d like. If you want the patch to be discreet, use a matching denim. If you want it to be bold, you can use a strong color or even a character fabric. 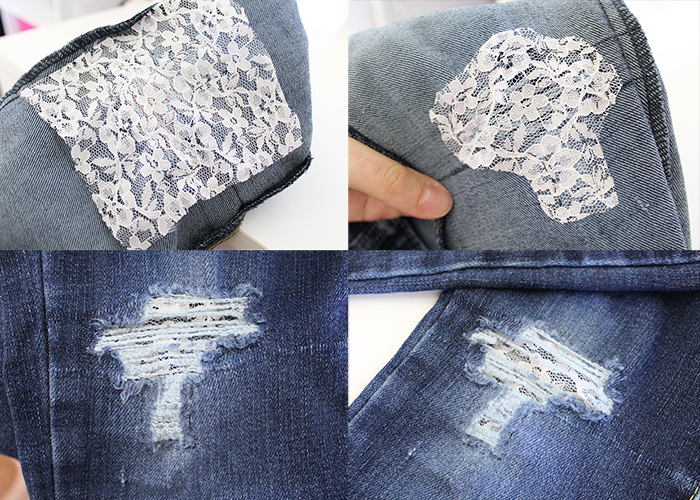 Turn your jeans inside out and place the fabric patch over the weak area. If you’re using a patterned fabric, make sure the right side of the fabric is down so the pattern shows correctly though the front of the jeans. 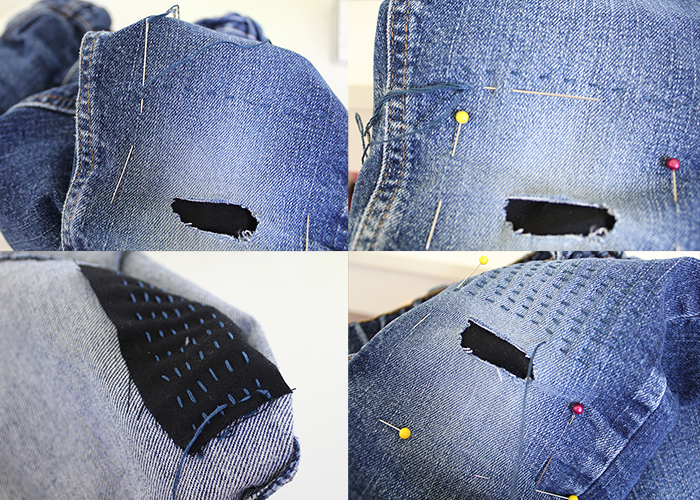 Pin it in place, making sure not to get the other layer of jean fabric, and then turn your jeans right side out. You can also pin from the front of the jeans if that’s what you prefer. Now take your embroidery thread and cut approximately 20 inches. You want to work with shorter lengths of thread so it’s less likely to tangle. Split the thread in half so you are working with three strands, and set the other half aside. You’ll use this when you run out of thread. Go ahead and thread your needle with the three strands of thread, and knot the end. I suggest keeping one hand inside the jeans, and the hand that is working the needle outside of the jeans. 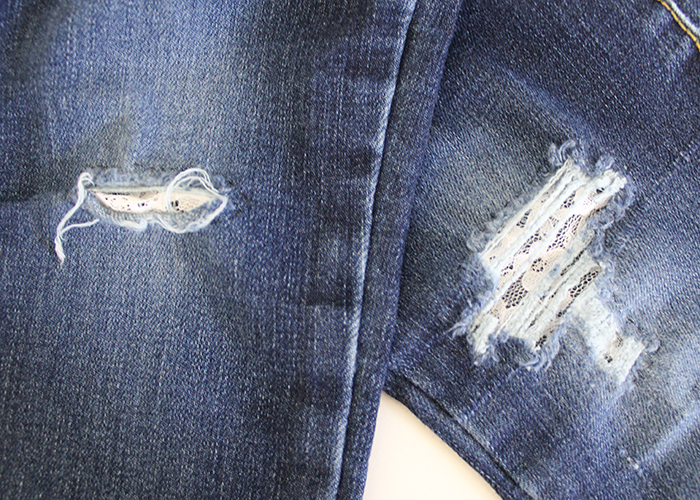 Come up through the fabric through the inside of the jeans, starting at the top corner of your patch fabric. Start doing a running stitch along the top of your patch, keeping your stitches as even and straight as possible. When you get to the end of your first row, put the needle down through the fabric and bring it up again where you want to begin the next row. Then continue stitching, keeping your stitches the same as the row above. When you run low on thread, try to end it at the end of a row. Knot it off on the back side, and start a new thread. And don’t worry if you make little mistakes like I did in the last photo here at the end of a row. They just add to the character of the clothing. Keep stitching rows all the way down the length of the patch. 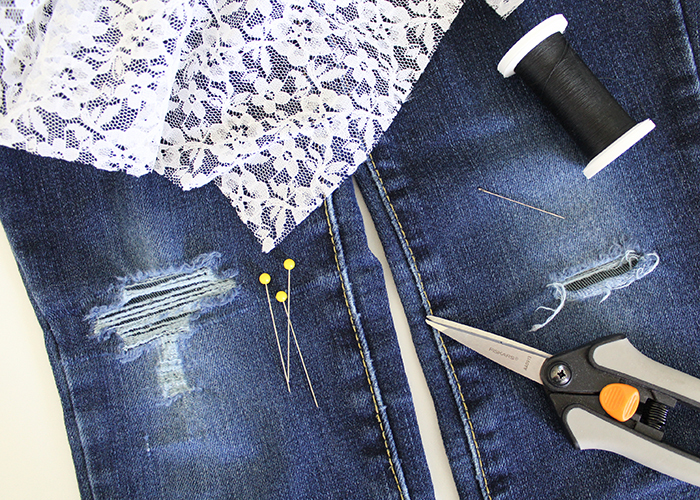 When you’re all finished, remove all the pins and turn your jeans inside out. 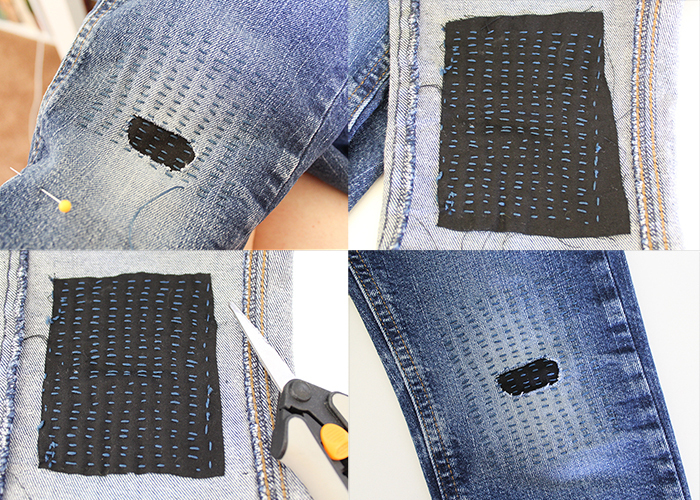 Trim any extra fabric around the edges of the patch, and then turn your jeans right side out. You’re all done! 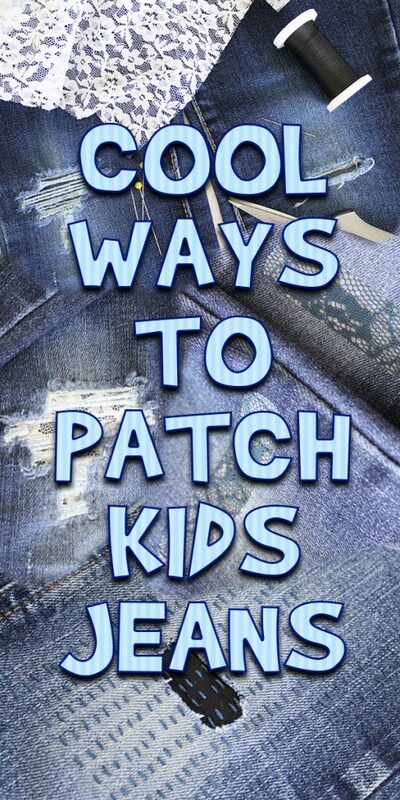 I love how modern and trendy this patching style looks! Now how about something cute for the girls? My oldest daughter loves clothes, and ripped jeans are very trendy right now. However, jeans can easily go from light holes in the knees to falling apart. Also, kids often catch their toes in the holes when putting them on, and can quickly rip a pair of jeans apart just putting them on. 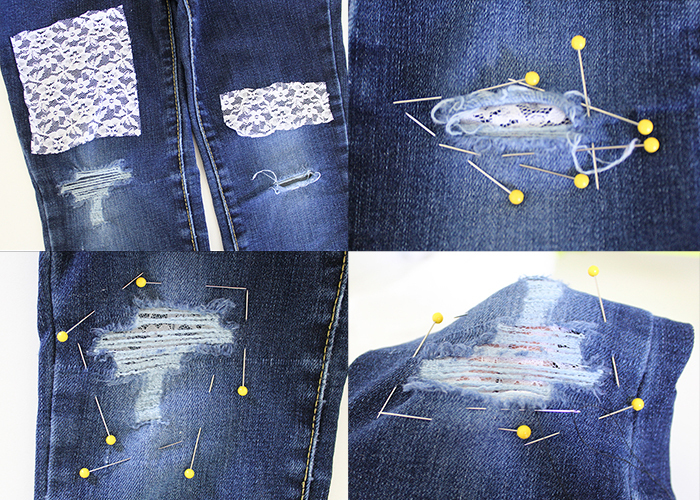 This mending method covers the holes so they’re easy to put on, and keeps the holes from getting too big. You can also use a cool superhero or camp fabric using this same technique for boys jeans! Scrap fabric. 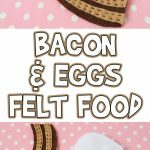 You can use lace, themed fabric, or any fabric you’d prefer. Thread. Blue, black, or whatever matches your jeans. 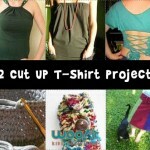 Cut your fabric larger than the holes you’re looking to cover. Then slide the fabric inside the leg of the jeans, and pin it in place. 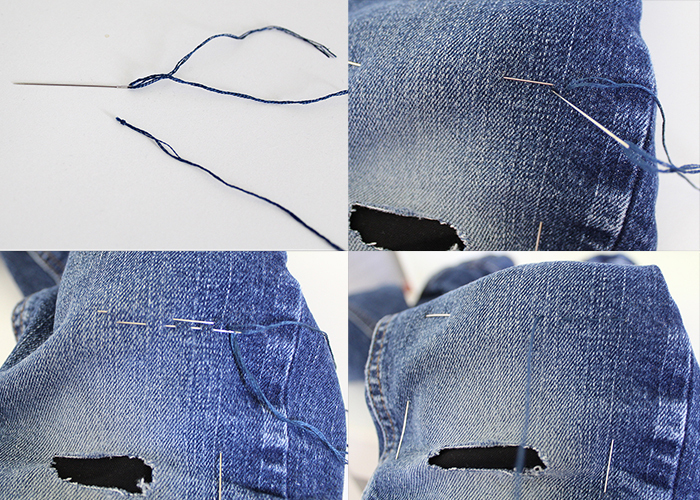 Take your needle and thread, and stitch around the edges of the holes using a basic running stitch. Turn the pants inside out, and knot the thread off in the back, and then trim around the fabric about 1/4 inch away from the stitching. Flip the pants right side out. Take a look at the hole, and make sure you’re happy with how it looks. I found that the stretchy threads of the jeans covered almost the entire patch, so I used my scissors to trim out a few threads so that the lace showed up better. It’s so cute!! I love the finished look, and this is a great way to turn those holey jeans into a fashion statement! Next time you’re at the store, take a peek and see how much jeans that look exactly like this sell for. It’s insane! So you just made trendy jeans and only spent a few pennies on extra fabric, rather than $50+ dollars for the same look. Can’t sew? No problem! 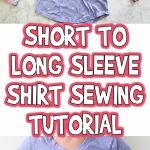 There are so many good iron-on products out there now that you can still get a super cute look without having to sew a thing! Plus this is super fast and easy for a last minute fix, and this double iron on method helps to reinforce weak knees. 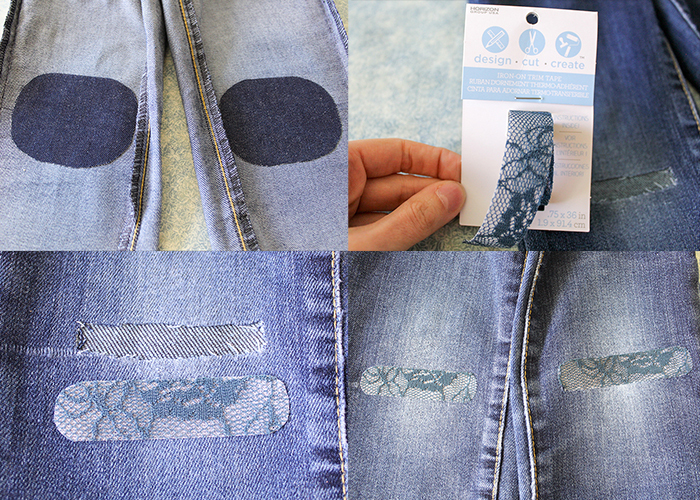 Denim iron on patching fabric. Iron on trim tape. Or you can use a cute iron on patch too. Start by trimming all the excess threads and rough spots around the holes. 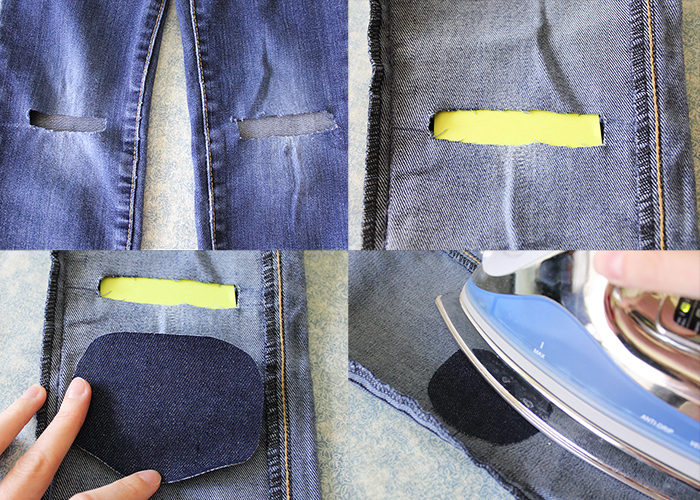 Then turn your jeans inside out and slip a piece of scrap paper into them underneath the hole. 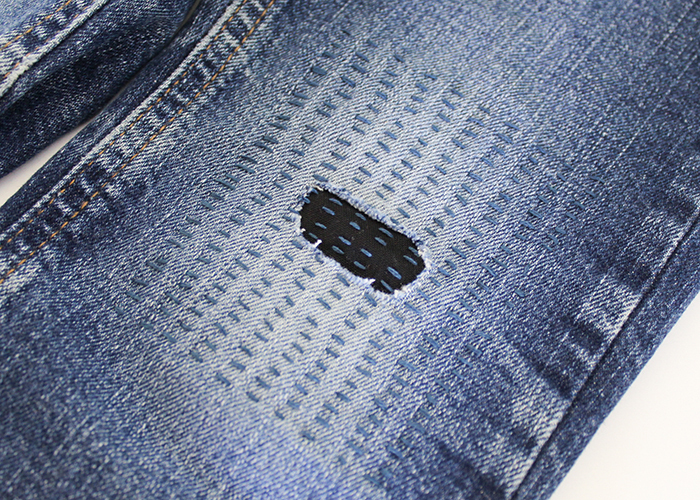 Cut a piece of your denim patching material larger than your hole. I like to make mine large enough to cover then entire area of weak denim. Make sure to round the corners (this helps prevent the patch from peeling up) and iron it down according to the package instructions. Let the patches cool completely before moving on to the next step. If you move an iron on too soon while it’s still warm, it can cause lifting. Next, turn your pants right side out. This is the fun part, where you add your patch or trim tape. I didn’t find any patches that I liked at my store, but I ran across this fairly new (to me) product called trim tape. It’s an iron on tape that’s designed to be used as trim on a hem on a shirt or pants. It comes in all kinds of patterns, including lace and even glitter! But the fun part of crafting is thinking of new ways to use products, and this tape is perfect for patching long thin rips in jeans or other fabrics. So I just cut a piece as long as my hole, rounded the edges, and ironed it on following the manufacturer’s instructions! And you’re all done! I think this is so cute, they look like little lace bandaids! 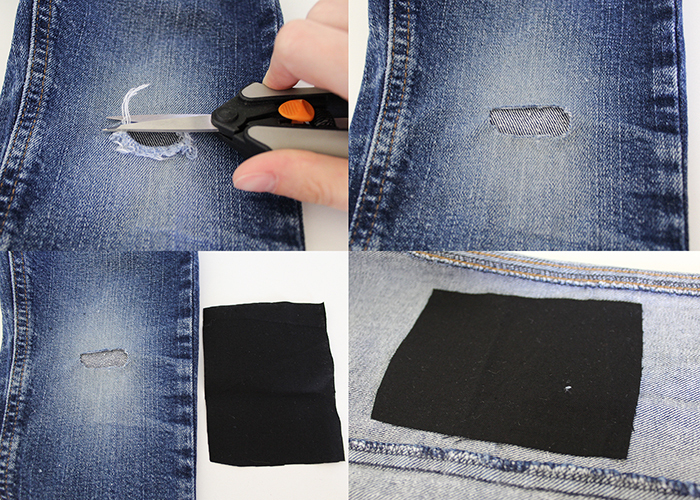 I hope you all enjoyed these three cool ways to patch kids jeans! 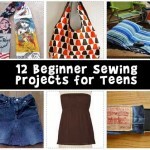 Ages 6-8, Ages 9-12, Easy Sewing Projects, For Teens	Joanna Brooks	clothes crafts, easy sewing projects, patching, patching jeans, recycled clothes, sewing, wearable crafts.